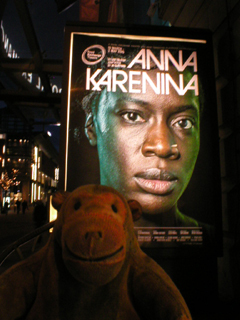 Mr Monkey arrived in Manchester by bus and scurried along to the Royal Exchange Theatre for the press night of Anna Karenina at the Royal Exchange. Written by Leo Tolstoy, Anna Karenina was published as a serial in The Russian Messenger between 1873 and 1877 and as a book in 1878. 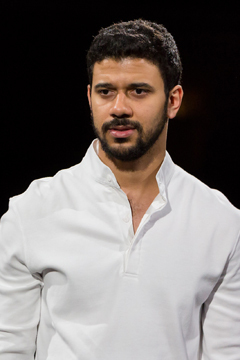 This production uses a new adaptation by Jo Clifford. Mr Monkey, not having read the book, is not sure what has been cut out but he suspects it's mostly philosphical musings. The play deals with three sets of relationships - a triangle involving Mr Karenin, Anna, and Count Vromsky; Anna's feckless brother Oblonsky and his long-suffering wife, Dolly; and the marriage of Kitty, Dolly's sister, and the Tolstoyish Kostya. All of these relationships have problems; only one solves them. The stage is empty except for a pair of tracks running from one side to the other. Four-wheel bogies are wheeled on to provide something for actors to sit, lie or lean on when needed. Resembling the bogies of railway carriages, they are a clear reference to Anna's end and to the fact that everyone in the play has an opinion on, or an interest in, the expansion of the Russian railway system. Mr Monkey noticed that the lighting around the main bar had been changed, with some new curved light standards over the seats, and thought it gave the impression of some fine 19th century railway station. Apparently this was a total coincidence and any resemblance to a station existed only in Mr Monkey's furry imagination. To adapt a long novel into a play of a reasonable length Jo Clifford has had to cut out a lot of text, and has done so very effectively. Most interestingly, this sometimes results in two actors being on stage together talking about each other, while the characters are several hundred miles apart. This does create a rather stylised feel to parts of the production. The cast are very effective in their roles, most doubling as peasants, doctors and railway staff as necessary. In particular Ony Uhiara and Robert Gilbert were so good as Anna Karenina and Vromsky that Mr Monkey quite disliked them, which, he claims, is praise of a sort. Ony Uhiara (Anna), Robert Gilbert (Vromsky) and Donna Berlin (Countess Vromsky) are also appearing in The Rolling Stone. Mr Monkey enjoyed this production, and recommends it to anyone who wants to know what happens to Anna Karenina but doesn't want to read the book. 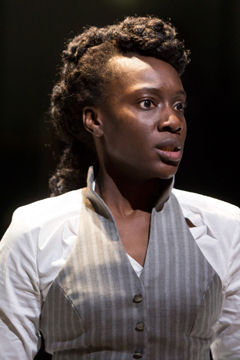 Anna Karenina runs until 2nd May 2015, in rep with The Rolling Stone from April 21st to 1st May. Copyright Rik Shepherd and Mr Monkey.